Incorporating movement and visual aids into a small group setting gets kids engaged in the Bible lesson. And nearly always, it helps participants of all abilities connect with the content. Kids who may not be great verbal communicators but who love to move around will love the following activity! Use visual symbols of pictures representing things talked about in the Bible lesson. Enlarge the symbols to be about the size of a fly swatter. 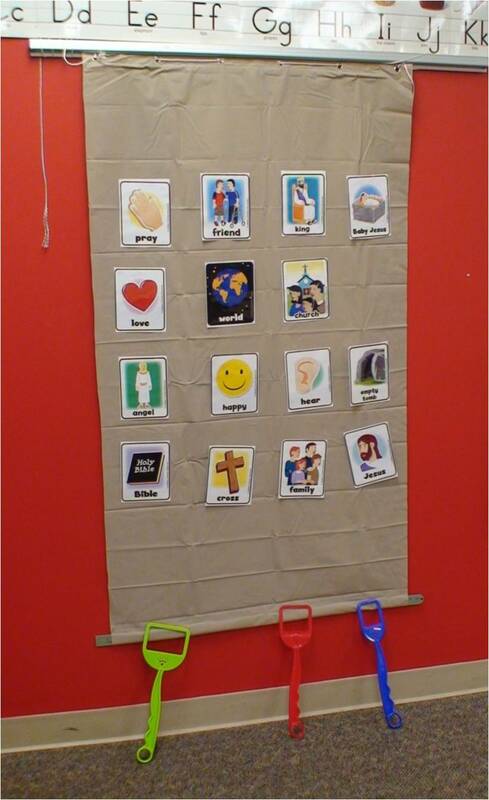 Affix these pictures to the wall and invite the kids to respond to questions reviewing the Bible story by swatting the corresponding picture symbol. Lifeway has provided a wonderful set of free graphics associated with Bible stories. In the below picture, I have downloaded a number of Lifeway’s free symbols, laminated them and then affixed them to a a plastic shower curtain. Here, I cut the shower curtain to my desired size and hung it from the wall. This activity creates all kinds of fun for antsy little boys and kids with sensory seeking needs or ADHD. 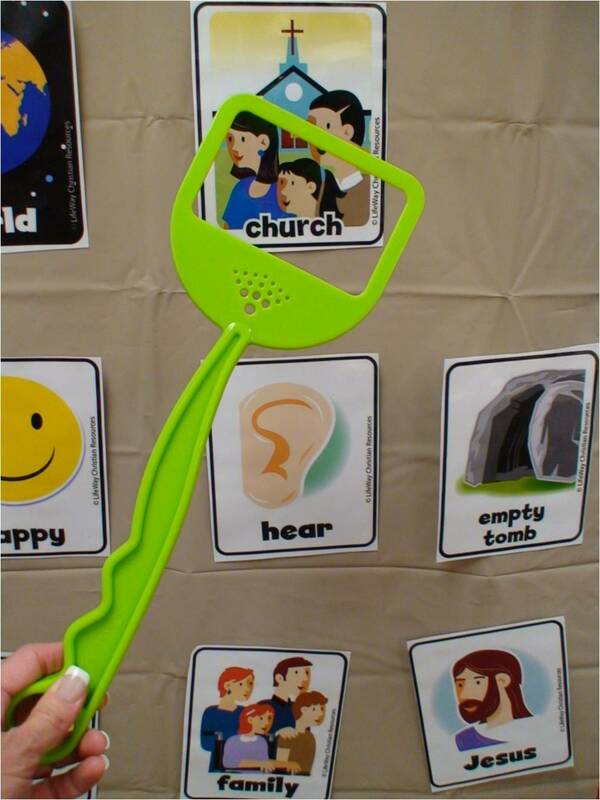 You may find that children remain attentive through the lesson, anticipating their turn to swat answers. Post pictures corresponding to the week’s lesson. And then create questions around those cards, where by swatting that picture card, the child is offering the correct answer. The picture graphics Lifeway provides on their Special Buddies website can be used for a number of great activities. For Memory: Print 2.5” or 3″ cards for four or five graphics related to the lesson. Make a duplicate copy for the selected cards. Display the cards face-down and have a buddy work one-on-one with a child playing a game of memory. Instruct the child’s buddy to either introduce or review the day’s Bible story by talking about each picture and how it relates to the Bible story. For Matching: This version of the game is great for kids with developmental disabilities. Follow the same instructions as above except display the cards face-up. Invite participants to point to matching pictures. 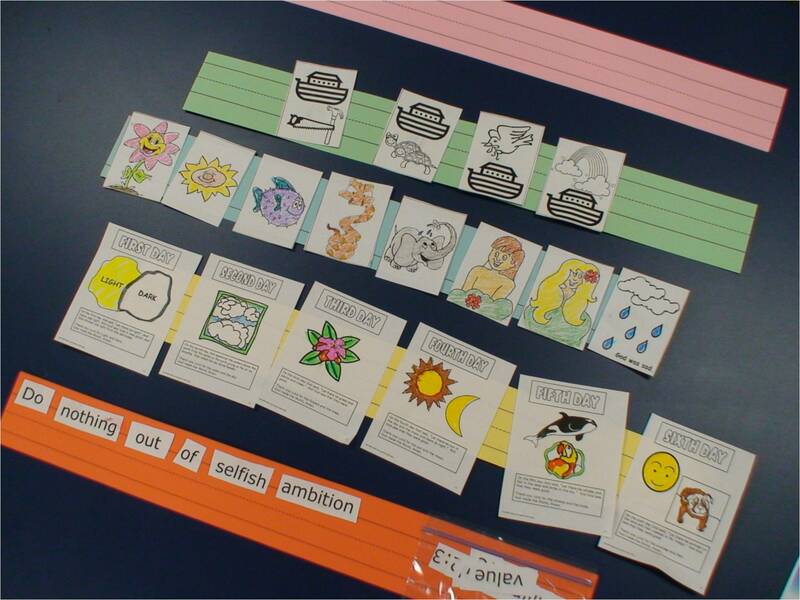 For Sequence Strips: Provide each child blank sentence strip, three to five pre-cut 2” color pictures related to the day’s lesson, and a glue stick. Invite the child to glue the pictures to their sentence strips in the order they appeared or were relevant to the Bible story. Amy, a really AWESOME idea. Thank you for sharing it.